The Omega tripod system, includes the extremely compact Omega fluid head. 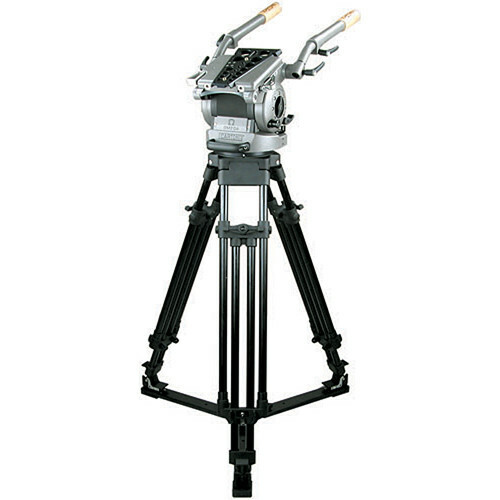 Designed to support the latest Studio and OB cameras equipped with long lenses, studio viewfinder or large teleprompter. The Omega fluid head incorporates an entirely new patented counterbalance system as well as an advanced fluid damping module ideally suited to operate with cameras featuring a high center of gravity and weighing from 77 - 154 lbs. The frictionless damping modules provide for extraordinary performances over an extended temperature range, with smooth and precise movements together with a linear response in any critical environment. And for ease of use the counterbalance and damping system are connected to easy-to-read digital readouts, allowing quick set up even in low light situations. Also includes the Superpod film-style twist lock tripod, constructed of 25mm diameter heavy-duty aluminum tubes, and is available in both single stage and two stage versions. Provides unsurpassed torsional rigidity and structural integrity, while the locking knobs, which include over tightening protection, ensures maximum clamping efficiency maintained over the tripods lifetime. Features continuously adjustable counterbalance system, allowing the cameraperson to fine-tune an extremely wide range of cameras featuring a high center of gravity and weighing from 77 - 154lbs throughout a tilt range of -/+ 65 degrees. Calibrated with a variable adjustment connected to a digital readout display, the counterbalance-operating knob is conveniently located on the side of the head. Features frictionless damping modules, which provide extraordinary performances over an extended temperature range, with smooth and precise movements together with a linear response in any critical environment. Located on the rear panel the continuously variable fluid control knobs are easy to reach and have the benefit of a digital readout, which allows the cameraman for a quick set-up even in low light conditions. The effective rear control brakes on both, pan and tilt mode are integrated with a side knob which allows the head to be fully locked in horizontal position for a fast and secure camera mounting. Box Dimensions (LxWxH) 38.5 x 24.25 x 16.0"